Just before 12:00pm today AFD was alerted to respond for the automatic alarm at 4600 Mercedes Drive in the 420 box. Shortly after the call was upgraded to a building fire with reports of sprinkler flow activation and fire in the dust collector. 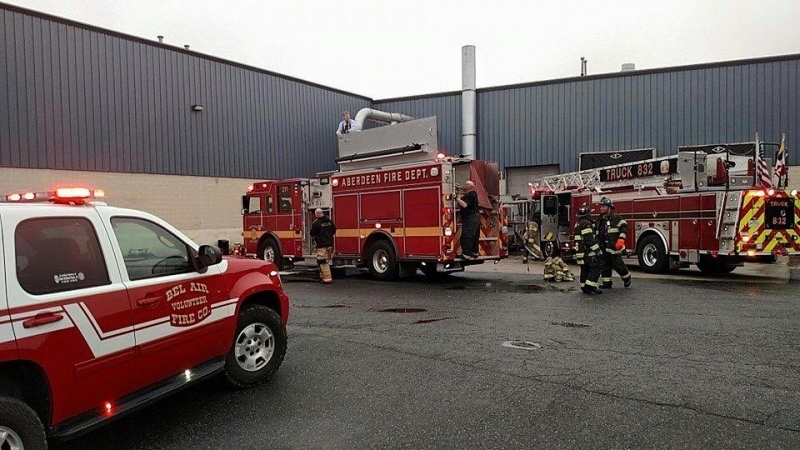 Companies arrived and located fire in the dust collector piping. Crews operated for approximately 1 hour before they started to clear the scene. No injuries were reported. Other companies on scene included Abingdon Fire Company Aberdeen Proving Ground Fire & Emergency Services The Bel Air Volunteer Fire Company Joppa Magnolia Volunteer Fire Company, Inc. (Official). Below is a picture during clean up stages of the incident. Courtesy of BAVFC.